After restoring our farmhouse in 2004 we can offer you upstairs 3 sleeping rooms furnished in typical country style, 2 bathrooms with shower, bathtub, WC and bidet for 6 persons and another small double bed room especially made for kids. Additionally we have a luxury suite for 2-3 persons including an own wellness-bathroom with interior design by Philipp Starck, including a sauna/sanarium for your recreation. At the entrance floor you will find the comfortable living room which offers a cosy atmosphere with chimney, satellite-TV, some English books and magazines. The equipment of the kitchen is perfectly stored with microwave, dishwasher, toaster etc. Outside the house you will find a romantic country-garden with a lot of typical flowers nearby the terrace. Shadowed by old trees you will find nice places outside to sit down into the grass or around the wooden table in the garden area. Enjoy the possibility of barbecue outside! And kids will be happy playing ping pong. City tours: A day trip, not too far away, takes you to the city of Ulm. The Ulmer Muenster has the tallest steeple on Earth. Shopping and strolling along the old Fisherman’s Quarter along the Danube River is also quite an experience. If you head east you will come to the beautiful and must see city of Munich, the capital of Bavaria, also formerly known as the “hidden capital” of Germany. Visiting the Hofbraeuhaus or Beergardens you will find the typical bavarian lifestyle. If you drive to the north, on the scenic road known as the “Romantic Road”, you will pass old medieval towns such as Dinkelsbühl and Rothenburg ob der Tauber (known for the Käthe Wohlfahrt year round Christmas store) and up to Wuerzburg. Going west you will reach Stuttgart, the automobile city with Mercedes and Porsche, lovely situated inbetween forests and wineyards, where you can taste the 'Viertele' at traditional 'Besenwirtschaften'. Scenic landscapes and points of interests: If you drive toward the south, you reach the foot of the Alps, and the famous town of Oberstdorf. This town is known for its beautiful ornamental wooden houses and, of course, the ski jumping, from local to world class and even Olympic competition. Take the cable car up to the Nebelhorn and what a view you will have! Not far away is the castle well known, even in the United States, named Neu Schwanstein. A trip to this point of interest may also be combined with two other well known places, the Schloss Linderhof and the beautiful baroque church, the Wieskirche. Nearby is also the Abbey, Ettal. Another daytrip that depends upon good weather would be to the Lake Constance to visit the city of Lindau but also the island of Mainau, with its beautiful blooming flowers. You can visit many of the small towns in the region such as Günzburg, Krumbach, Memmingen, and Ottobeuren. These towns will give you an impression of the architecture and culture of this part of Southern Germany. Bathroom 3 is added to the suite. Great location and base for the start of our family vacation. The owner met our group, showed us all we needed to know and was very helpful with suggestions as to local dining options. Location was great for planned trips to Munich and Stuttgart. We were 10 in total and the accommodation’s fit quite well. Would definitely recommend to other groups of similar size. Great that you were traveling to all the automobile museums and "Octoberfest" and other highlights around us as Heidelberg, Rothenburg, New Swanstein etc. Fine that you've tasted some of our recommended dining locations with typical bavarian food. Beer gardens with big trees and beer halls under old vaults seems to be a special experience for our guests. That's what makes the time unforgettable. Lovely house in the German countryside, with plenty of space in and around the house. Thank you for letting us stay in your country home during our "Bavarian Adventure". We found it to be a great location and a welcoming home with everything we could need. What a wonderful time we had! Using the house as a base, we were able to explore the area. Castles, lakes, mountains and museums were all fun to see. Everything in the house seemed to run very well and was very clean. We enjoyed our stay in this lovely farmhouse. One day we took the train into Munich for Oktoberfest and on another day we explored beautiful Ulm. The countryside around Gunzberg is beautiful and good restaurants were an easy drive away. We would definitely recommend this property. I'm happy that you've enjoyed my two insider tipps for your very short time at us. To go by train to the Oktoberfest is perfect! Ulm has on the one hand a very old center, on the other hand a modern one closeby. This city is perfect for to study german urban development during the last decades. We rented this house for a large family reunion and it was just perfect. Everything was as described. The house is in a perfect condition, everything is well maintained and very modern. But still the house has kept its original character. The landlords were wonderful and very helpful. The distance to Legoland is just perfect. We had a wonderful stay and can highly recommend this property. Only one little thing: there's no wifi. But didn't matter - we were on vacation. Thanks for giving us the possibility to stay at your wonderful location. What a big family with 16 persons in all! I'm happy to hear that all of you felt fine in our home. For more than 10 adults we can offer apartments up to 4 nearby if wanted. In our big lounge which is located in the old former stable you will find a wonderful place for your come-together to dine, to relax, to play. Please ask us for individual arrangements. You also will be welcome again with a more increased family. And be sure: once a time you will be able to surf by wifi. As well as watching TV now is possible on a big flat screen since the fantastic FIFA-World Cup by our German Team. WE also do our very best! The listing description was accurate and the owners were very friendly and helpful. The house was clean and well-maintained, and the surrounding gardens and front porch terrace were beautiful. The kitchen was huge and well-equipped for our group of 5. The bedrooms were large and the beds were very comfortable. The little town where the house is located is charming. We enjoyed our walks and bike rides in town. The house also was a perfect base for exploring Bavaria by car or train. The closest train station is Gunzburg, which is about a 15 min. drive from the house. Grocery store and restaurants were about a 5-10 min. drive from the house. We enjoyed a trip to Ulm, and the Ulmsberg Abbey restaurant and beer garden, both of which were recommended by Heike, our host. We would recommend this house for anybody who wants a quiet, peaceful place for a vacation, or for those who want a comfortable home base for Bavarian day-trips. I'm happy that you enjoyed my recommendations for dining at the Abbey Ursberg closeby, which offers typical bavarian meals and homemade beer, as well as the daytrip to Ulm with its fishermen's quater along the river Danube and the highest church tower of the world. Ulm is about 40 minutes away from us and loved by everybody who visited this charming city. The bavarian capital Munich is best to do by train from Gunzburg. Traveling by this way you will be in the middle of the city, close to all the highlights, the beer gardens and all the exclusive boutiques for shopping. 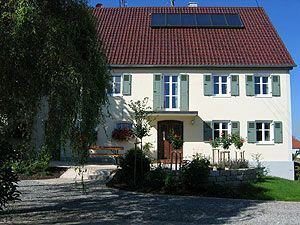 With all the possibilities for exploring Bavaria from our house as a well situated home base please don't miss to take a break in our spacious house and especially in our lovely garden. The area we are situated is called „Allgäu“ and seems to be very rural. Even so you can reach a lot of well known highlights on the highways within one hour from us.